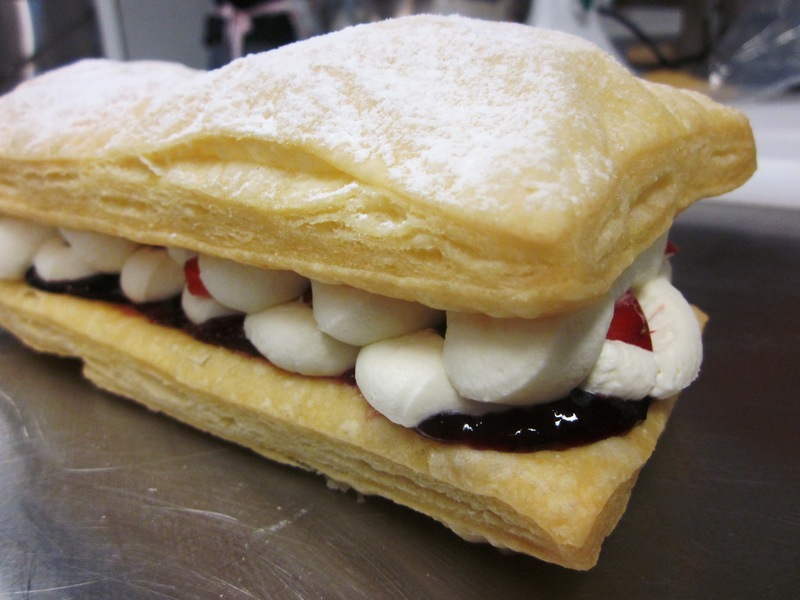 Of all the types of pastry we learnt during the 6 classes I attended, this is the one that I enrolled for and really wanted to do. I was supposed to attend a Mille Feuille class with Sarah at babyCakes last year, but unfortunately it was cancelled due to lack of interest. 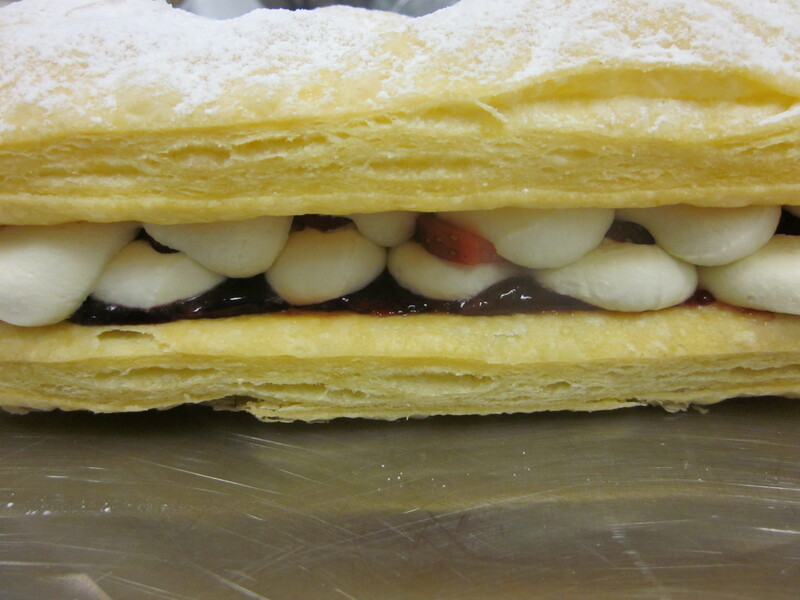 So I was thrilled when Sarah told me about the 6 week pastry class at TuartCollege, which included a class on Mille Feuille using rough puff pastry. I’ve really enjoyed this 6 week course and have found my confidence with pastry has really grown. I can’t wait to give full blown puff pastry a try when I have time at home. But in the meantime, it’s great to now have this quicker rough puff pastry up my sleeve. It tastes great, with the flaky layers, rise and crispness you expect from puff pastry, but in a lot less time. Yum. Next time I make it at home, I will take step by step photos of the folding and update the post. But for now at least, here is the recipe. To make the pastry, mix together the flour and salt in a medium sized bowl and then add the butter. Rub the butter into the flour until some of it has formed crumbs. You will still have some large clumps of butter. Add the lemon juice and just enough iced water to form a dough (but don’t get the ice in it). Place onto a lightly floured work surface and roll out into a rough rectangle (about A4 sized). Fold into thirds like a business letter. That is, fold the top over about two thirds, and then the bottom over where you just folded the top. I will post pictures next time I make it. Turn the pastry by ¼ so the narrow end is now facing you. Roll out again to the A4 size and repeat the fold. Wrap in cling film and place in the fridge for 10-30 minutes. Repeat steps 3 and 4 one to two times so that you, in the end, fold the pastry a total of 4 – 6 times (turning ¼ turn between each fold). After the final fold, roll out into a rectangle about 0.5cm thick and then cut into two equal sized rectangles (the removable base of a rectangular tart tin is a good template). Place the pastry on a tray (lined with baking paper) and bake in the oven for 18 – 20 minutes until puffed and golden, and then allow to cool. Meanwhile make the filling by whipping the cream with the sugar and vanilla. Once the pastry has cooled, turn one rectangle over so you have a flat surface to pipe on. If using, spread some jam over the base and then pipe some of the cream over evenly. Place the sliced strawberries on top of the cream, pipe over another layer of cream and then place the second slice of pastry on top. Dust with icing sugar and drizzle with melted chocolate if using.